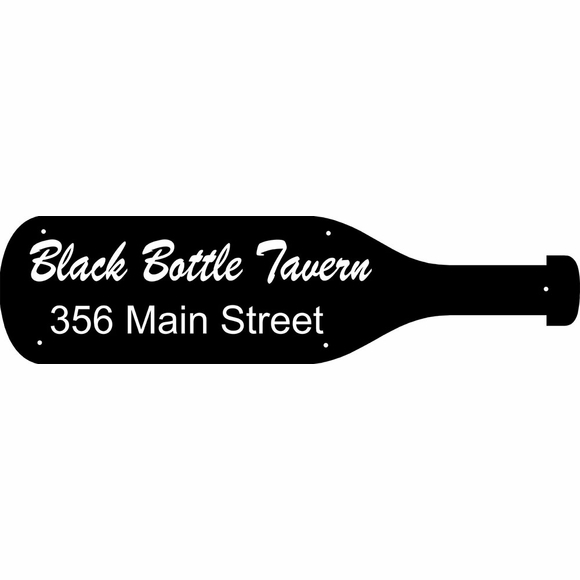 Bottle Shape Personalized Address Sign - - custom made Bottle Shape residential or commercial signage. The perfect business name sign for liquor stores, bars, and taverns. Made in America. Personalized with your choice of color and two lines of text you specify (does not need to be an address). Line 1 holds up to twenty (20) 1.75" characters. Line 2 holds up to 20 (20) 1.25" characters. Line 1 holds up to ten (10) large 3.5" characters. If using just 1 line, please leave the Line 2 input box empty. Made from sturdy and UV-stabilized non rusting laminated acrylic with engraved printing. Comes with five 3/16" diameter fastener holes and mounting screws. Dimensions: 23"W x 6"H x 1/8". Laminated acrylic bottle shape sign crafted in the USA by skilled artisans to assure the highest quality.